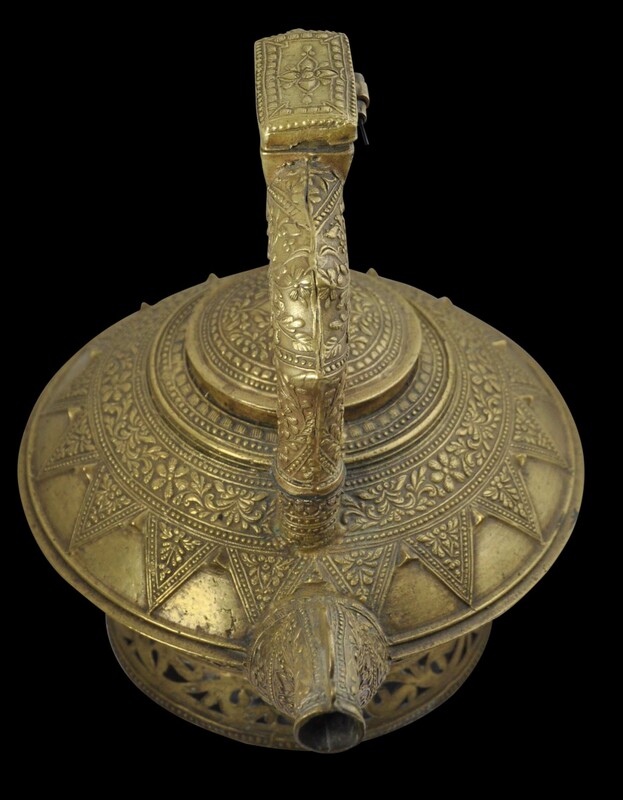 This kendi is a particularly interesting example of Malay and Minangkabau brassware cast using the lost wax process. It has a ‘flying saucer’ type body; a ‘false’ lid that doesn’t actually open to the top of the body; and a prominent hollow handle, the top of which has the actual opening and hinged lid through which the vessel is filled. It sits on a flared, ring foot that is pierced with floral scrolling motifs. The spout is slightly zoomorphic. The body is decorated with a band of stylised triangular bamboo shoots (tumpal or pucuk rebung) filled with floral motifs separated by raised triangular nodes. 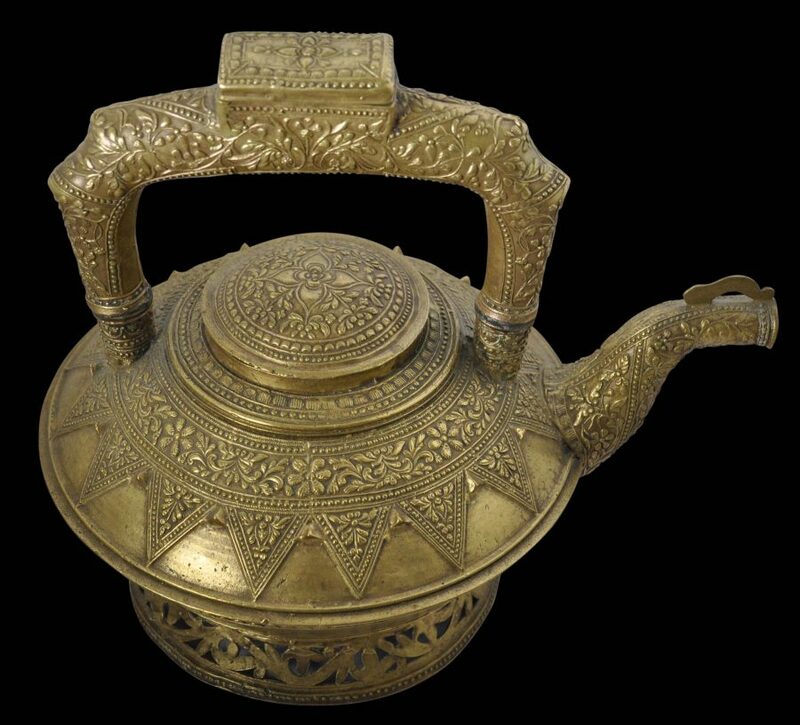 Pucuk rebung motifs are an identifying characteristic of Malay and Minangkabau brassware. They are also commonly used in Malay textile design and woodwork. 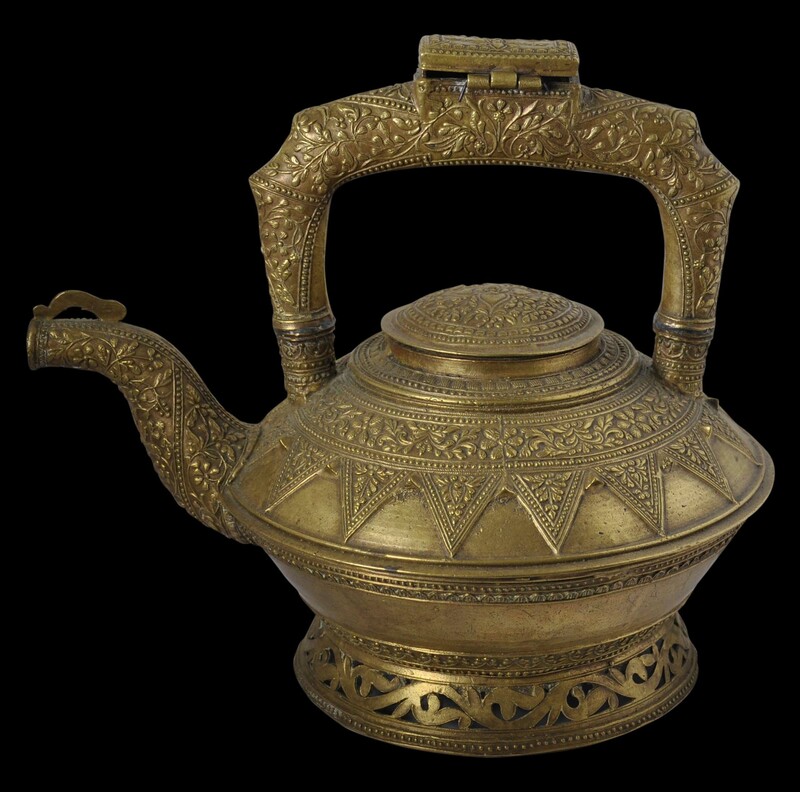 The unusual way in which the vessel is filled – from the top of the handle – shows influence from Mughal India where some ewers for holding water were similarly constructed. Related examples of the false lid ewer type are shown in Singh (1985, p. 23). ANother is illustrated in Jasper & Pirngadie (1930, p. 103). 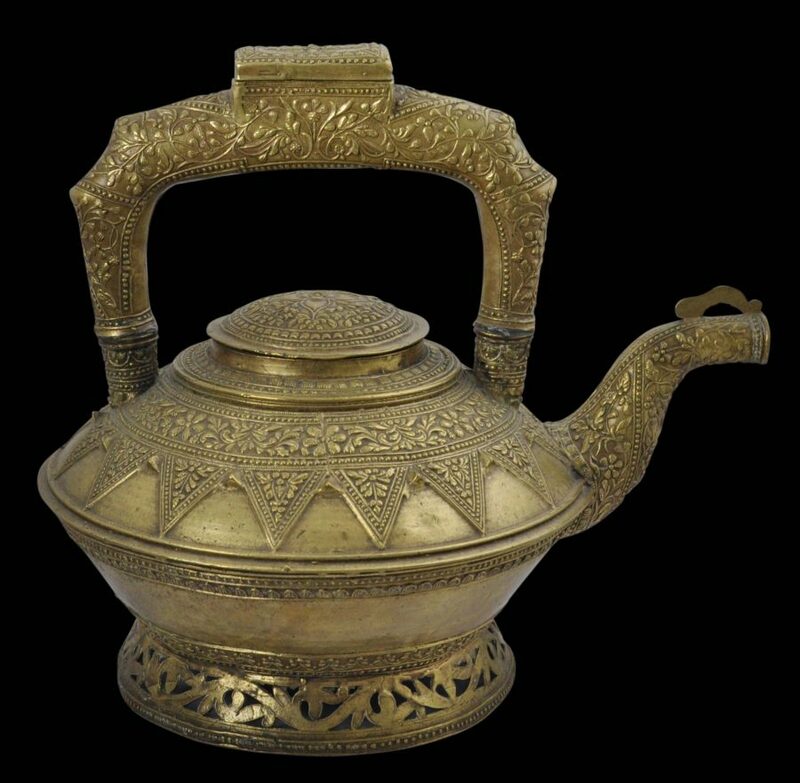 Vessels such as this example were cast by matrilneal Muslim Minangkabau brass casters either in Sumatra or possibly on the Malay Peninsula. They were made for Malay and other clients and were used to hold and serve drinking water. The neck functions as the handle allowing the spout to be brought up to near the mouth and for the water to be poured into the mouth. Water storage vessels were important among the Malays – drinking water tended not to be boiled first but allowed to stand for a few days. Allowing the water to stand was felt to purify it. Certainly it allowed any sediment to settle. Although such vessels most probably were made in Sumatra by the Minangkabau, they often appeared on the Malay Peninsula for use by local Malays and others, a trade most likely facilitated by Minangkabau settlers who lived in and around Negri Sembilan state on the Peninsula. This example is in fine condition. The hinge has an old replacement wire to keep it together but otherwise, the piece is in original condition.